Reading, MA - On Sunday, October 15th, Reading Cooperative Bank (RCB) both volunteered at and participated in the 4th Annual “Take Action” Walkathon hosted by the Lawrence Boys and Girls Club. The walk is two miles, beginning and ending at the Boys & Girls Club of Lawrence with a turnaround point at New Balance in Lawrence. The walk is a gathering of the local community and consists of business employees, families of the club, and volunteers who help throughout the year. This year, the entertainment included music, face painting and games. The walkathon attracted over 200 people and raised over $35,000 to support its educational opportunity programs. The Boys & Girls Club of Lawrence serves 4,400 members aged 7-18. The organization offers a wide variety of programs that foster academic success, healthy lifestyles and community service. The kids come to learn and grow in a safe, out-of-school setting. The club provides them with educational programs, homework help, sports, meals, and is supported by its local community. 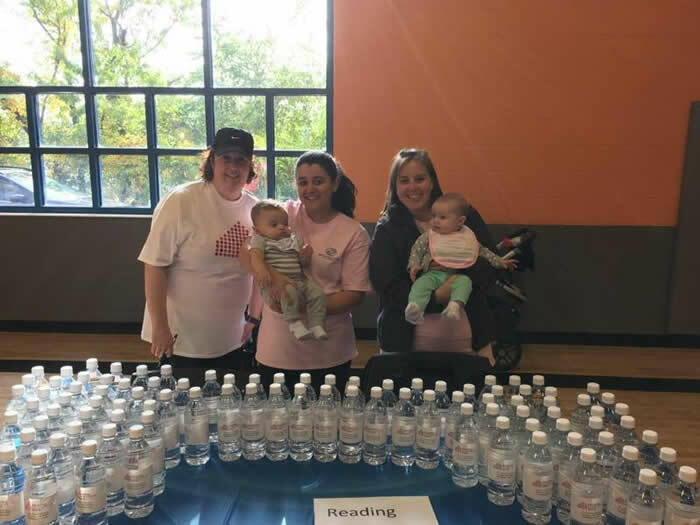 RCB’s Donna Dickie, Assistant Vice President/Loan Servicing, Kara Worthington, Senior HR Generalist, and Michelle Nunez, Banking Specialist, all took turns handing out water bottles at the club’s gymnasium, while Sasha DiPietro, Loan Processor, decided to join the festivities and walk the course.